We’d love your help. Let us know what’s wrong with this preview of Missing, Presumed Evil by Garth Nix. To ask other readers questions about Missing, Presumed Evil, please sign up. Is the book TroubleTwisters the Missing a good book? Good end to the series! I wasn't sure where this series was headed, what with the foreshadowing dropped in earlier books. But this book was roundly satisfying. From the Evil dimension to Grandma X's real name, all was finally revealed. I read it aloud to my kids, and we were all hooked. I hope they end the series here, because I think further books would detract from the high note this one ends on. Edit: Also, Missing, Presumed Evil is a MUCH better title than The Missing. What dumb marketer thoug Good end to the series! I wasn't sure where this series was headed, what with the foreshadowing dropped in earlier books. But this book was roundly satisfying. From the Evil dimension to Grandma X's real name, all was finally revealed. I read it aloud to my kids, and we were all hooked. The plot seemed a little too close to "Subtitle Knife," for my taste. Aleksander has something he calls Project Thunderclap, which he hopes will close off the bridge that allows the Evil access to Jack and Jaide's world. The description of the home world comes from a movies scene in Pirates of the Caribbean: Dead Man's Chest. Over-all its a depressing read. I've really, really enjoyed reading this series. Although it might not have been quite as good as Nix's Old Kingdom series, I much preferred it to the Seventh Tower series, and it's almost as good as the Keys to the Kingdom series. Not only was the philosophical reasoning very interesting and mature, the ending was not entirely predictable and I loved that. I've not read any of Williams work before, but this is definitely a good piece from Nix. If you love Nix's writing, do give this series a go. Decent conclusion to a decent series. The best of the series! Young adults will most definitely enjoy reading this series particularly if the Harry Potter series was within their reach. It's a great series and easy to relate to. We’re back with Jack and Jaide for their darkest and most dangerous adventure yet. Missing, Presumed Evil is still full of wit and humour, but there’s a definite dark tinge to everything that happens, signalling how far the twins have come since we met them. This book begins with a letter that almost strangles Jack in its eagerness to be read: Grandma X’s sister is still alive in the realm of The Evil, asking for a rescue. An exciting adventure follows, with our twin protagonists Jack and Jaide b We’re back with Jack and Jaide for their darkest and most dangerous adventure yet. Missing, Presumed Evil is still full of wit and humour, but there’s a definite dark tinge to everything that happens, signalling how far the twins have come since we met them. This book begins with a letter that almost strangles Jack in its eagerness to be read: Grandma X’s sister is still alive in the realm of The Evil, asking for a rescue. An exciting adventure follows, with our twin protagonists Jack and Jaide beginning a series of Examinations that will bring them closer to being full Wardens, and an insufferable new houseguest named Stefano who will try their patience. I was surprised to find how accepting Jaide, in particular, is of Grandmother X’s silence throughout this book. After three books of chaffing at being treated like kids (they’re twelve, it’s a hard time for everyone involved! ), the twins now understand that sometimes their father and grandmother keep them in the dark to keep them safe. They have also come a long way in understanding and controlling their Gifts, and I really liked how they had to learn how to use their new abilities in this book. One of the things I liked about Missing, Presumed Evil is that Jack and Jaide no longer sound, to me, like they’re twelve years old. They sound much older in the ways they speak and think, which was great for my enjoyment, but it was confusing to be reminded of exactly how young and inexperienced they are. Introducing Stefano, another troubetwister, is an interesting choice. Like the twins, I didn’t really know what to make of him. On one hand he’s a great contrast to Jack and Jaide – he doesn’t really get along with his own twin and he is slightly further along in his training than they are. But I’m not sure whether he actually added anything to the story – many of the lessons he was able to impart could have been taught by existing characters. I spent a large part of this book waiting for Jaide to develop a crush on the exotic troubletwister, but thankfully she didn’t. Of all the exciting developments in this book, perhaps the one that disappointed me the most how the authors dealt with The Evil. After spending three books telling readers that the entity is very bad and horrible, so nefarious that it only needs to be called ‘The Evil’, the mythology is completely turned on its head in the last few chapters of this book. Suddenly, there’s a whole new way to look at the situation, one that isn’t naive and black-and-white. In my opinion, this revelation was handled clumsily, and I would have liked more clues to have been left in earlier instalments, and a less rushed ending. Missing, Presumed Evil is a great adventure and I have thoroughly enjoyed my time with Jaide and Jack. I am unsure whether there will be more books in the series, but I’d absolutely read more if there are. Packed with fun, danger, magic, family and friends, the Troubletwisters series is perfect for younger readers and those who enjoy rollicking adventures. Well, okay. Apparently, I really didn't like the first two books in this series. (Troubletwisters, The Monster). I'm also not an enormous fan of Lisa McMann's Unwanteds series or Whitesides Janitors. I opine all the time that there are too many fantasy books out there. So why do I read these? Why do I buy them? My students. While it is true in my library that there are fewer students who read fantasy books, the fantasy readers are insatiable and often will ONLY read fantasy. I do try to keep all Well, okay. Apparently, I really didn't like the first two books in this series. (Troubletwisters, The Monster). I'm also not an enormous fan of Lisa McMann's Unwanteds series or Whitesides Janitors. I opine all the time that there are too many fantasy books out there. So why do I read these? Why do I buy them? My students. While it is true in my library that there are fewer students who read fantasy books, the fantasy readers are insatiable and often will ONLY read fantasy. I do try to keep all of my students happy. It was a great moment when I delivered books to classrooms on the last day of school before Christmas break-- out of 100 books, I had to get 12 checked out right away, and if it hadn't been past 2:00pm when the shipment came in, it might have been more! When Grandma X receives mail from her long long sister Lottie, who was lost to The Evil in some horrific accident with The Evil, she wants to rescue her, but it wo't be easy. It doesn't help that Jack and Jaide are about to undergo their Examination, and exchange student Stefano from Italy moves in with the family. The three do okay on the first couple of exams (the point of which I missed entirely), but The Evil starts talking to them and taunting them to come find Lottie. They eventually seek the help of Rodeo Dave and get more information. Meanwhile, Aleksandr is in charge of Project Thunderclap, which is supposed to defeat The Evil, which is targeting Portland, where the story takes place, specifically. Lottie appears, takes on Stefano and injures Grandma X, and Jack gets sucked into the Evil dimension with Kyle, Tara and Cornelius, where they fight bugs and other things. Stefano and Jaide volunteer to help with Project Thunderclap, which involves drawing power from storms into a lodestone. In the Evil dimension, Jack meets Lottie and makes some progress at getting to the portal, but then stalls. Luckily, Jaide makes it through to him and helps guide Jack's ship through the vortex, bringing The Evil into Portland with them. Will Grandma X be able to defeat The Evil? Strengths: Lots of action and adventures, things blowing up, and running around. The characters are fairly distinct, and I was able to follow along by keeping notes. Weaknesses: Still a little unsure about whole point, why and how they manage to defeat The Evil, what exactly that is, etc., but that might be because... I just don't care. Pretty sure this is the last book in the series. Hope so, but could be wrong. Nalini Haynes reviewed this book; for more reviews by Nalini, see Nalini Haynes on Dark Matter Zine. 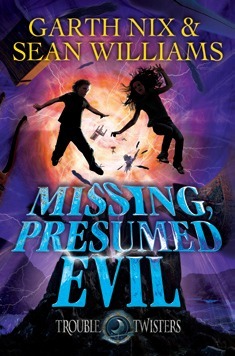 Missing, Presumed Evil is the 4th in the Trouble Twisters series for children aged 8 to 12 by Garth Nix and Sean Williams. I previously reviewed The Monster and Mystery of the Golden Card, the 2nd and 3rd in the series respectively. Jack and Jaide, the magical Troubletwister twins, discover an animated letter that attacks Jack in an effort to be read, revealing Grandma X’s twin sister is alive in Nalini Haynes reviewed this book; for more reviews by Nalini, see Nalini Haynes on Dark Matter Zine. Jack and Jaide, the magical Troubletwister twins, discover an animated letter that attacks Jack in an effort to be read, revealing Grandma X’s twin sister is alive in the Evil dimension. Stephano, an arrogant over-achiever only a little older than the twins, comes to stay with them. Rivalry erupts almost immediately. The Evil tries to break through to Earth and succeeds. Nights are spent housecleaning: killing insects that are part of the Evil’s gestalt intelligence. The Warden council decides to seal off Earth so the Evil can never again re-enter the world. Jack and Jaide discover the Wardens have factions, some of whom argue to preserve the Evil. This shades-of-grey trope is one of my favourites but in Missing, Presumed Evil this trope didn’t come into full force until the denouement. At the very end, this trope bore forcefully down upon the reader who anticipates future installments. Those who follow Sean Williams on social media will be aware of his love for Brussel sprouts that almost amounts to a fetish. Hector, Jack and Jaide’s father, also loves Brussel sprouts; Hector’s love for the green vegetable is viewed as an anomaly. Nice touch. This book was an entertaining adventure and a fitting conclusion to a good storyline. The Troubletwister twins, Jack and Jaide, are still trying to combat "The Evil," the mysterious presence from another dimension. This is the darkest and most dangerous adventure so far with a dark tinge over much of what happens. The twins’ characters have grown up during the series and are less quarrelsome and more thoughtful, although there is still some humour in some of the things that happen and how the tw This book was an entertaining adventure and a fitting conclusion to a good storyline. The Troubletwister twins, Jack and Jaide, are still trying to combat "The Evil," the mysterious presence from another dimension. This is the darkest and most dangerous adventure so far with a dark tinge over much of what happens. The twins’ characters have grown up during the series and are less quarrelsome and more thoughtful, although there is still some humour in some of the things that happen and how the twins perceive them. This story starts with a letter being found and, when it almost strangles Jack in its eagerness to be read, they realise that Grandma X’s sister, Lottie, is still alive in the realm of The Evil. She is asking for someone to rescue her. This begins a series of events that leads up to the satisfying conclusion, with both the disappearance of Lottie and what to do about The Evil being dealt with. On the way Jack and Jaide begin a series of Examinations that will bring them closer to being full Wardens, Stefano, another Troubletwister, joins them when he is sent to learn from Grandma X and Jack and Jaide are separated and have to find out about their strengths on their own and how to best use their gifts to survive. There will be more in the series but there will have to be a slight change of direction. ...And so I guess this closes the Troubletwister series? OH MAH GOSH, THESE BOOKS - SO AMAZING. The Missing basically wraps up everything this series has been hiding since book 1, and I loved it all. Very satisfying. The ending was the best part for me, as I didn't foresee it turning out that way at all. It was unpredictable and even a little bittersweet. Jack and his friends going into the(view spoiler)[ Evil's realm was really interesting too. (hide spoiler)] I thought it would've been scarier ...And so I guess this closes the Troubletwister series? OH MAH GOSH, THESE BOOKS - SO AMAZING. The Missing basically wraps up everything this series has been hiding since book 1, and I loved it all. Very satisfying. The ending was the best part for me, as I didn't foresee it turning out that way at all. It was unpredictable and even a little bittersweet. Jack and his friends going into the(view spoiler)[ Evil's realm was really interesting too. (hide spoiler)] I thought it would've been scarier, but whatever. Gwahahaha. Jack and Jaide Shield have defended themselves against The Evil before -- but it's never been as dangerous as this. It isn't just the town of Portland that's threatened, it's the whole Earth . . . and certain dimensions beyond. The Wardens have devised a plan to get rid of The Evil once and for all. The only problem is that destroying The Evil may also mean abandoning some innocent people -- including one of the twins. The battle against The Evil is going to places it's never been -- places Jack a Jack and Jaide Shield have defended themselves against The Evil before -- but it's never been as dangerous as this. It isn't just the town of Portland that's threatened, it's the whole Earth . . . and certain dimensions beyond. Seriously disappointed to the level that I didn't even read on past the first chapter or two as after the initially excting 3 books to find that in this 4th installment the authors have let us down by making the two lead characters-the twins Jaide and her brother turn out to behave no better than spoilt little upstarts when confronted with all the other Wardens in the Hall of Mirrors is just awful, I cringed instantly in frustration and closed the thought of reading any further! This is one of the few Garth Nix books endings that I liked. I mean, I liked the other books, but the endings just didn't seam to work for me. Although, I would like to know if Jaide and Stefano get together. And what the fourth Examination is. But No one died, Grandma X is good, and Lotte is back! I'd say that is a very good ending. Good book, nothing amazing, but nothing bad. Just in the middle. I don't know if I'll be continuing this series, but then I'm not sure it's even continuing at all. It kind of wrapped up nice and neatly, though there were a number of possibilities for future stuff too. Still, I don't think I'll read them anyway. Jaime and Jack are tested to see how they are coming into their powers. At the same time they learn about Grandma X's twin sister and that she may be alive. Grand and scary adventure follows as the twins seek to find a way to stop the evil and save Grandma X's sister. Well done. This has been a good series with lots of action but good lessons too. Oh Troubletwisters you sure do get yourselves into some big trouble. I love you Garth Nix, and while these are getting better they're still no Keys To The Kingdom. I'm not entirely sure I understand the ending. Im not sure I understand the how. Maybe kids will grasp the concept better than me but I'm confused with this complex concept. Finished my first book of summer. It wasn't the conclusion I expected but now I know why she was called Grandma X! All 4 books were well written. I like how the non magical kids were sucked into the dark other world and how the 4 folks made it back to our reality. The plot was a little too close to "Subtitle Knife" for my taste. When Jack gets transported to the world where the Evil originated, the description sounds close to where Jack Sparrow wakes up in "The Dead Man's Chest." I love this series - lots of fun, adventure and bravery by all. Good fun and a rollicking great read. Garth Nix and Sean Williams are definitely moving up on "My Favorite Authors List". Each book gets better and better. It's a reaaly good series, even if there is only 350 pages per book. Fast-paced. Kids will love all the magical creatures, supernatural powers and good vs. evil. A very solid conclusion to the series. Not too predictable and all the secrets and mysteries are wrapped up well. Probably my favorite book in the series! This book seems to fill in a lot of the plot holes. I am not sure what direction the 5th book will take. There are still a lot of unknowns in terms of Grandma X. 3.5 stars is about right for this book. Great end to the series with a few surprises. De Garth Nix was born in 1963 in Melbourne, Australia, to the sound of the Salvation Army band outside playing 'Hail the Conquering Hero Comes' or possibly 'Roll Out the Barrel'. Garth left Melbourne at an early age for Canberra (the federal capital) and stayed there till he was nineteen, when he left to drive around the UK in a beat-up Austin with a boot full of books and a Silver-Reed typewriter.